Geek Girls Rule! #235 – Review: Miskatonic School for Girls – Geek Girls Rule!!! 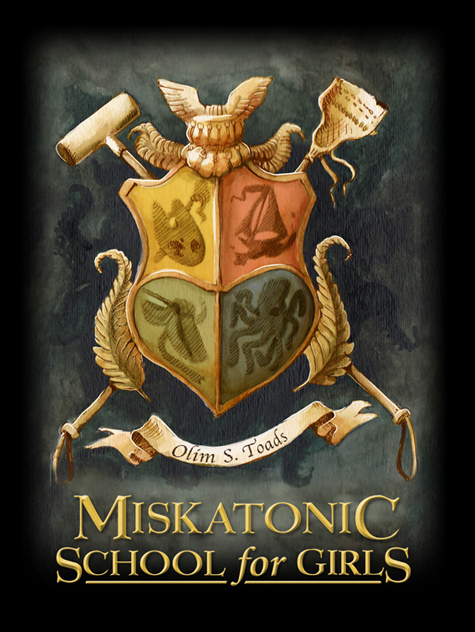 Cover for Miskatonic School for Girls, by Fun to 11. So I mentioned in the last post, that we played Miskatonic School for Girls (which can be purchased at Amazon ) created by Fun to 11 Games a little over a week ago. It’s a cute game, cashing in on the popularity of Lovecraft themed anything. The premise is that each player has a “House” at a girls’ school (a la Hogwarts or St. Trinian’s) and that the faculty are all cultists, Elder Gods, or cthonian nightmares out to get the student body. Each person gets a board to represent your house, and a starter deck of first year students. To start you draw five of these cards into your hand. Each student card has five numbers on the front: 2 at the top (one of these is in a heart icon, these are friendship points, one is in a Cthulhu icon, these are nightmare points), 2 in the middle (one of these is in a mallet, these are the damage your student does, one is on a shield this is the damage your student soaks), and there is one final number at the bottom in a bigger heart, this is the number of friendship points your student costs. You add up the numbers in the hearts at the top to draft other students, events, or locker cards from the student store, or you add up the numbers in the Cthulhus at the top to buy faculty from the faculty store which you give to the player to your left. If you cannot or do not buy a student, you get to take a transfer student from the pile at the end of the store. And if you cannot or do not buy a faculty member for the person to your left, they take a substitute teacher from the pile at the end of the Faculty store. The rounds of play go as follows: You pick up any students or faculty in your purchase pile, fill out the rest of your hand to five. Add up Friendship or Nightmare points to purchase students, locker cards or events for yourself, or faculty for the next player along. Faculty also have Friendship and Nightmare points to add to your purchasing power, and their costs are in a bigger Cthulhu at the bottom of the card. After you purchase, put any student cards in your hand in the discard pile, and put the faculty in your Classroom. You draw as many cards from your deck as you have faculty in your Classroom. If you draw students, add up the points on their Mallets, to see if you defeat your Faculty. If you do, remove them from play, and discard everything. If you cannot remove any or all of your Faculty, add up the points from your students’ Shields to see how much damage they soak. If they do not defeat all of the faculty and/or soak all the damage, then you lose sanity, by sliding a counter along the bottom of your board. You go until every person but one loses all their sanity. If you draw Faculty during this part of your turn, they become “Pet Faculty” and you can give them to other players. Some of the Faculty and Student cards have special powers or conditions that bring them into play sooner, do more damage if they are not defeated, or move them from player to player. Event cards can help or hinder, as can Locker cards. The gameplay, once we figured it out, was pretty fast and entertaining. The the majority of card names reference characters and places in H.P. Lovecraft stories, and the illustrations are pretty damned adorable. It’s a beautiful game. The game is fun once you finally figure it out. The rules could have used a good technical editor, because they’re really not clear about a few areas. And we play a lot of Speil des Jahres games, which means we spend a lot of time reading instructions that were originally written in German and then translated to English. So, yeah, the rules need some revision. But the game itself was delightfully fun. We had a great time playing it, and I would gladly play it again, especially since we can speed through what were initially a pretty laborious two first rounds, trying to figure it all out. If you like the blog or the podcast, or if you would like to help fund our burning board game addiction, please, please, please donate to keep us going. Donations go to pay for the podcast hosting and website domain, primarily.